Dr. Vladimir Pastouk was elected as the Director of US Education for PTIFA in 2013. Dr. Pastouk is a graduate of PTIFA’s program, and has extensive experience treating botulinum toxin (aka: Dysport®/Botox®) and dermal filler patients in his Cleveland practice. 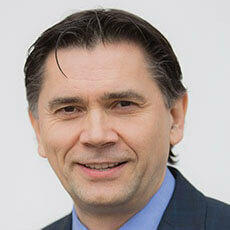 Dr. Pastouk is a 1991 graduate of the Kiev Medical University School of Dentistry in Ukraine, and based on his academic excellence, he was offered a position in the department of periodontology, where he developed a comprehensive dental implant program in the annual curriculum of dental students. Dr. Pastouk is a well-respected industry educator, and is known for his abundant leadership and aesthetic mastery. He continuously lectures at local dental schools that graduate dental specialists. In 1993, Dr. Pastouk relocated to the US and worked at University Hospitals of Cleveland and participated in no less than 500 medical and dental surgeries. In 1998, Dr. Pastouk completed the Boards successfully and having acquired tremendous experience in surgery he attended the Advanced Standing Program at the College of Dentistry at Nova Southeastern University in Fort Lauderdale with honours. Upon graduation, he was recognized for the highest clinical grade point average as well as outstanding ability in clinical dentistry. In 2002, Dr. Pastouk returned to Cleveland and fully dedicated himself to dentistry with an emphasis on cosmetics and implants. He completed a year-long program in modern dental implantology and advanced bone grafting in Atlanta. He is continuously focused on investing a tremendous amount of time on continuous education. His sole goal is to provide dental excellence to his patients by creating beautiful smiles. Dr. Pastouk offers acupuncture in his current practice, as another option for patient pain management, and also diagnoses and treats sleep apnea and snoring by application of the newest technologies. Dr. Pastouk is an active member of the International Stomatognatic Honorary Alliance, and a sustaining member of the Academy of Cosmetic Dentists. Furthermore, he is distinguished as an Associate Fellow of the American Academy of Implant Dentistry as well as a Fellow of the International Congress of Oral Implantologists. Dr. Pastouk is a fellow of Misch International Institute, and was also awarded a Silver Medal at the International Implant Congress in Barcelona, Spain for a cosmetic restoration of a missing tooth using a dental Implant. Dr. Pastouk was granted privileges to lecture on the clinical aspects of obstacles that may arise from restoring dental implants and their periodontal management at the Euro Asian Congresses. He regularly lectures internationally on topics of implantology, bone and soft tissue grafting, cosmetic restorations of dental implants and natural dentition. In 2011 and 2012, he was named €œLeading Physician of the World & Top Cosmetic and Implant Dentist in Cleveland, Ohio by the International Association of Dentists. Dr. Pastouk is a Diplomat of the International Congress of Oral Implantologists and was recognized as one of best trained dentists in facial rejuvenation procedures.